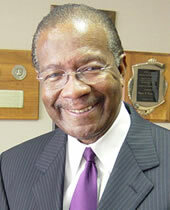 In 2004, at the age of 70, Charles C. Teamer, Ph.D. accepted the position of President of the World Trade Center in New Orleans. As New Orleans becomes an increasingly significant center for international trade and commerce, Dr. Teamer was an ideal choice to lead the organization. With over 20 years of service to the World Trade Center, his extensive background in economic development and his vast experience with international relations has brought ambassadors from numerous nations to Louisiana, stimulating trade relations and economic growth. An avid entrepreneur who is deeply committed to the economic growth and development of the New Orleans area, Dr. Teamer is probably best known as the man behind the dynamic growth of Dryades Savings Bank. Backed by a group of minority investors, Dr. Teamer bought the troubled Dryades Homestead Bank in 1990, confident that he could breathe new life into the failing institution. And so he has. As Chairman of the Board, Dr. Teamer guided Dryades Savings Bank into a respected institution that now boasts more than 100 million dollars in assets. Not one to rest on his laurels, Dr. Charles Teamer appears more active than ever, eagerly applying the knowledge and skills he has gained through a lifetime of experience toward the betterment of our community. From his leadership of the Amistad Research Center to his support of scouting, higher education, the United Way and the American Red Cross, Dr. Teamer knows that active participation is essential to building a stronger community, and “folks his age” have invaluable knowledge when it comes to making decisions today that will affect people years from now. Dr. Teamer never anticipated that he would be this busy at the age of 70 (including his recent induction as national President of the Sigma Pi Phi fraternity! ), but time and again he has revealed the incredible achievements that can be realized when you never lose focus from your goal. Devoted to improving his community, his city and the lives of the thousands of people he touches, Dr. Charles C. Teamer embodies the heart of a Champion… a Tenet Choices Champion.